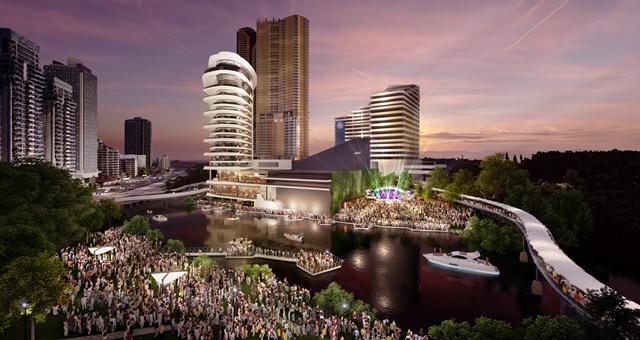 The stage will face the park, creating a waterside concert venue at The Star Gold Coast. Concept image only. Subject to all necessary approvals. Music events ranging from world-class talent to string quartets and Christmas carols will be staged at a new outdoor concert venue set to be constructed at The Star Gold Coast, the company announced today. Two sections of parkland either side of the Nerang River will be available for public viewing of the onstage entertainment, with the furthest being situated in Centenary Park. The stage will be constructed in such a position so as to face the park, with additional seating on the casino’s foreshore. Planning for the proposal so far has indicated a parcel of vacant land on the casino’s canal-front be developed to include the stage along with portable food and beverage outlets, with an estimated capacity of up to 1,500 people. Additional development in the area will see the viability for a zipline attraction constructed adjacent to the hotel and casino complex. The Star Entertainment Group CEO, Matt Bekier, said the proposal is aimed at helping the Gold Coast compete with capital cities to attract the best musical talent from around Australia and the world. “What a wonderful example of the Gold Coast lifestyle to be able to listen to concerts across the water, whether it’s rock, jazz, classical, or an event that appeals to all ages. “The Star Gold Coast theatre is an established venue and has regular performances by leading musical acts. The Gold Coast Convention and Exhibition Centre is also a venue we believe could be further enhanced and promoted. But this outdoor venue could provide a real point of difference for the coast,” he added. Bekier added that the proposal was still taking shape and that all necessary approvals were yet to be obtained from relevant local and state authorities. The proposal for the new venue comes two months after a Master Plan was approved by the Queensland government, potentially bringing in as much as $2 billion in investment for the area as well as other projects currently underway in Brisbane.